National Geographic ScienceBlogs: The Future of Desalination in California is Still in the Future: California, Israel, and Australia	Huffington Post: Where Does California’s Agricultural Water Go? In a climate where rainfall is so variable from one year to the next, it makes little sense to talk about what is “normal” but California farmers know to expect that some years will very dry and that sometimes there will be a string of dry years back-to-back. Media coverage of the current California drought has included various attempts to describe where California’s water goes, from flushing toilets to growing crops to bottled water to supporting fisheries. One high-profile target in the media has been California’s major nut crop – almonds – which has been described (and often vilified) for its water use. Many stories have latched on to an estimate that each almond kernel (nut) requires around a gallon of water to produce. And if so, what does it really mean? Acreage of Almonds: In 2014, there were approximately 870,000 acres of almond orchards (bearing) throughout the state, up from around 510,000 acres in 2000 and 770,000 acres in 2010 (USDA 2015). 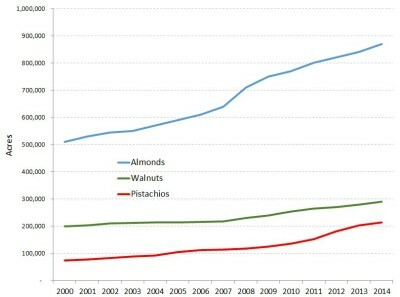 Figure 1 shows the massive expansion of almond, pistachio, and walnut acreage between 2000 and 2014. Total crop acreage in California during this period remained relatively constant due to reductions in plantings of field crops. Water Use per Acre of Almonds: All crops require water and the total water requirement varies throughout the growing season as a function of temperature and other climatic factors, the characteristics of the plants themselves, soil conditions, irrigation methods and efficiencies, and more. For almonds, the crop water requirement is roughly between 40 and 55 inches per year – more in the hotter southern California region; less in the cooler northern California areas. Average water use is approximately 44- 48 inches per year (UC Davis; DWR). Certain advanced irrigation methods, such as regulated deficit irrigation, can cut this by as much as 30% or more, but these are not widely applied yet and such methods also may affect crop yields and quality. Almond Yield: What does an acre of almond trees produce annually? In California, between 2010 and 2014, almond production averaged 2,325 pounds per acre according to the USDA National Agricultural Statistics Service. Nuts per Tree or Weight per Nut: The US Department of Agriculture reports that in California the average number of almonds per tree is around 6,700, and the average weight of each almond kernel (the part we eat) is around 1.4 grams per nut. Total Water Use for Almonds: Combining these numbers we estimate that total applied water use for almonds in California was around 3.1 million acre-feet in 2010. That number was almost certainly higher in 2014, but no final data for last year are available yet. Water per Almond: When combined with the yield information above, almonds required between 1.6 and 1.7 gallons of water per nut, somewhat higher than the 1 gallon per nut commonly reported elsewhere, but of a comparable magnitude. Is this a lot of water to produce an almond or a little? How much water does it take to grow a grape, watermelon, head of lettuce, or cow? Is such a measure useful? It is too simplistic to look at the amount of water required to produce a specific item and pass judgment, without understanding global markets, technology, climate, and more. Farmers make choices of what crops to grow based on many factors and signals, from market prices for commodities, to the quality of their soil, to water availability, to the kinds of equipment in their barns. There is a strong market for almonds and they produce good returns to farmers. In addition, water-use efficiency in almond orchards – that is the amount of water required to produce a particular good or service – has been improving over time as better irrigation technologies and methods have been applied. This is a good thing – it permits growers to produce more food and income per unit water. But it is also true that the massive expansion of California orchards – especially almonds – imposes some real negative costs to communities, leads to the loss of local groundwater where some wells are drying up, and reduces the flexibility of the State to deal with shortages when permanent crops replace crops that can be temporarily fallowed in bad years. Local opposition to new orchards is growing rapidly and a backlash is likely. A spotlight is being shined on the role of corporate investors in the agricultural sector. In the end, if the gap between water supply and water demand continues to grow, California will have to make fundamental changes to agriculture in a way that ensures both a strong agricultural sector and a healthy environment. The conversation about how to do this must include a discussion of incentives, disincentives, regulatory and market conditions, and impacts to all affected parties. In the end, it is about far more than just almonds. of clean pure water per day at very reasonable rates when compared to the other options of using the water source available. If anyone is serious about providing a solution to the current disaster now facing much of the western United States. Distillation is a process of purifying water that has been recognized for thousands of years and now I have put a lot of current items used by individuals daily together to achieve different results. Everyone has seen or even used some of the items such as solar water heaters and solar electric panels so the technology has been around for years, it just needed to be applied for a different purpose.It may take some wealthy individuals to get together and build the first unit before governments will be willing to put up a million dollars for a quick sure fix for the problem. Anyone who wishes to discuss or help build a system contact me at hitchcoxb@yahoo.com. Little is mentioned in this article, if any about, the cropping methods. I have traveled the central valley many times and what I see is industrial chemical farming. To quote a world famous environmentalist, ” There is no more discuss all the world scientist agree” bad choice. Industrial farming destroys soil structure, pollutes water, pollutes the air-dust, methane and CO2 are most prominent and easiest to measure . This does not even count the carbon foot print of fertilizer production and other agriculture related chemistries. The release of CO2 from the soil is 7 times greater than all the current other anthropomorphic activities, fossil fuel production and consumption, concrete production and urban and suburban expansion, combined . No till farming with a multi-species cover crop sequesters and cleans water, sequesters carbon and other toxins such as selenium. Farming with diverse species cover crops requires little or no supplemental watering and produces crops with a higher nutrient density. No-Till less labor intense, add in the savings from no chemicals therefore more profitable and does not pollute the environment.